Posted in Mainstream Polish, pictures	by Jessica W.
Hi everyone! So this past weekend I went on a nail polish hunt for the newest Sinful Colors collections: Spring Fever, Luck of the Stylish (St. Patrick’s Day), Kandee Johnson Sugar polishes, Kandee Johnson Vintage Matte polishes (the ones I was missing), Stoned Crystal Shimmer, and the Kandee Johnson Vintage Anime polishes. I also picked up some new (and old) core colors. I won’t have these on the blog this week (hopefully starting next week!) but I thought I’d share bottle shots of what I picked up! This is the Spring Fever collection. From left to right: 2213 Vibrant Vida, 2214 Besos for Pesos, 2216 Let’s Playa, 2211 Havana Great Time, 2215 Fool for Azul. (All of these are straight cremes.) I can’t pick a favorite, but I’m really loving the whole color palette. In the Sinfully Polished Nails group, we are thinking that there might be more additions because as you see, 2212 is missing from the line-up! And yes there is – it’s called Rojo Your Boat. I’m on the lookout! This is the Luck of the Stylish collection [swatched & reviewed]. From left to right: 2204 Works Like a Charm, 2205 Queen of Green, 2008 Gilded Goddess. Not pictured is 2206 I’m Clover It (glitter). I really love how Works Like a Charm looks – it has a gold shimmer to it that compliments the base color very well. Gilded Goddess is not new, but I didn’t already have it, so I picked it up. I picked up three new polishes from the core collection and one old one. From left to right: 945 Soul Mate, 2196 Jade Kat, 2198 So Daupe!, 2199 Deep End. I know Soul Mate is an older core color, but it just looked so pretty I had to have it! Jade Kat is not as blue as pictured, it is more green IRL. So Daupe! is a straight creme, and Deep End has a green shimmer. Now Kandee Johnson polishes! These two are the “sugar” aka textures: 2274 Mint Sugar, 2277 Pink Sugar [swatched & reviewed]. I enjoyed Pink Velvet textured polished (previously reviewed), and I hope I’ll enjoy these two as well. These three are from the Vintage Matte collection: 2273 Peaches N’ Cream, 2275 Licorice, 2276 Cherry on Top. Both Peaches N’ Cream and Cherry on Top have a beautiful gold shimmer in the bottle. Licorice is absolutely stunning in the bottle with gold, red, and green shimmer! Lastly, I picked up the 8-piece Stoned Crystal Shimmer collection. Front row: 2217 Better Sedona-Ed, 2218 Just Deserts, 2219 Tealing Power, 2220 Namaste the Night. Back row: 2221 Clay Me, 2222 Desert Reign, 2223 Thera-Pewter, 2224 Gotta Terra Cotta. Each bottle has silvery flecks in it. I’m most excited for Just Deserts and Thera-Pewter but we will see what other ones I love! Edit: this is a 9 piece collection, which includes Super Cooper. Some great shades you picked up! Can’t wait for swatches. I’m really looking forward to hearing your thoughts! Sinful has been on fire lately – I also just bought a bunch online because unfortunately there are no drugstores in my town. I really want those Stoned Crystals! 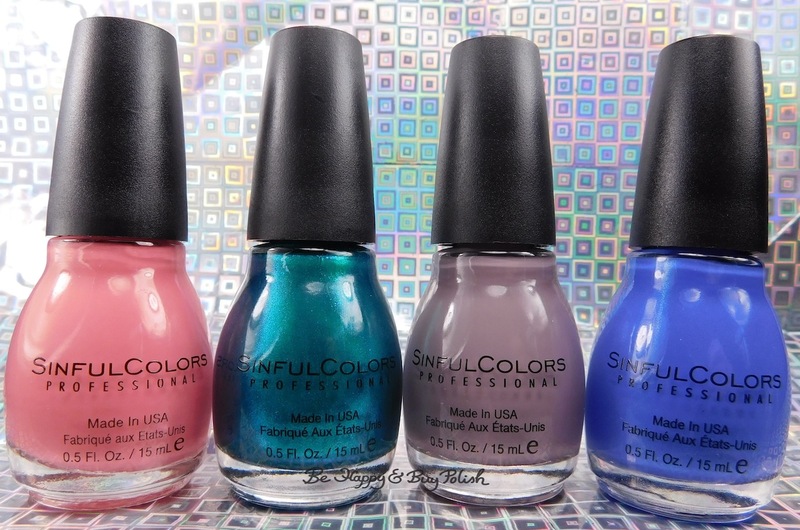 Sinful Colors are so affordable, and the formula are so good, you can’t go wrong with these! From your haul, I love the look of So Daupe!, Works Like a Charm, and Cool Credit. 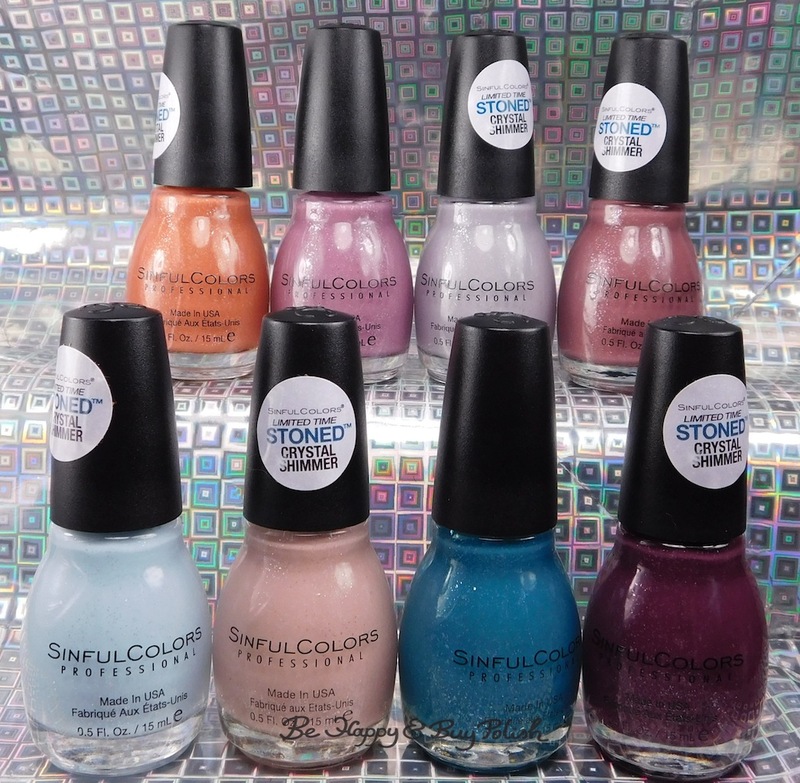 I didn’t know that Kandee Johnson did a collection with Sinful Colors – neat! I really want to see how those stoned crystals look on the nail! Hi. Your Spring Fever collection is mislabeled. I own Havana Great Time (4th from left) and Let’s Playa (3rd from left). I only point this out because I am curious as to the other three polishes. 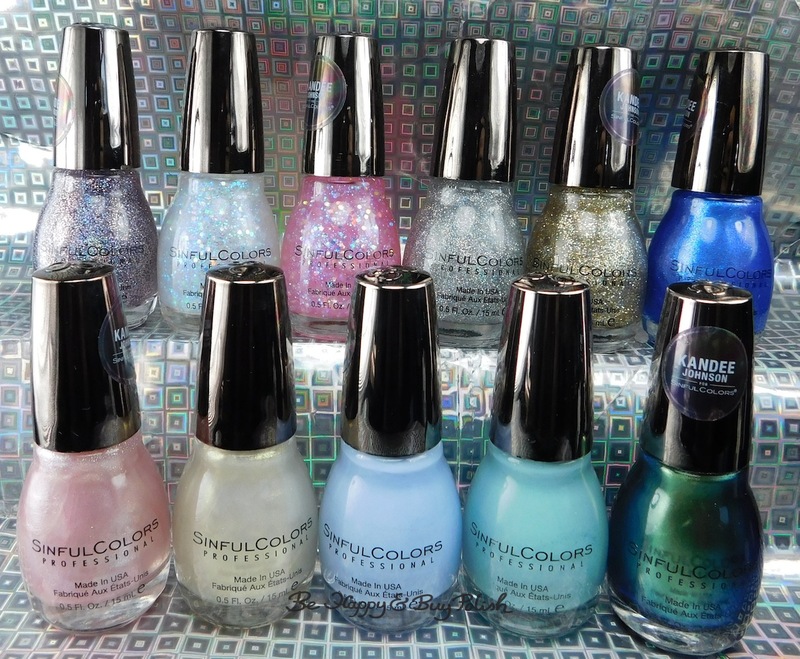 I can’t believe Sinful Colors doesn’t even list this collection on its site- someone has dropped the ball! Thanks for the help! You know what? They aren’t mislabeled, I just didn’t double check before I wrote the post! 😛 haha! Thanks for commenting though, I’m fixing that now. I really love that purple one, Namaste the Night. Strange name but it’s beautiful and I want it. Checked their website and this collection isn’t even there! I don’t get it. Hope these aren’t hard to find. They all look so pretty! Where ever did you find the stoned crystal shimmer? I found them in the big Spring Fever display at Walgreens. Happy hunting! Thank you, they haven’t “landed” at my Walgreens yet. Can’t wait to see them on you! Background is so creative and really enhances the photo! It makes the colors look that much more impressive! I am desperate to find the full stoned collection. Does anyone out there have an extra Namaste the Night, Super Cooper, Gotta Terra Cotta, Clay Me or Better Sedona-ed they are looking to sell?? I saw the entire collection in Harmon’s about a month ago. I picked up Namaste the Night. Then I went back for Gotta Terracotta about a week later and the collection was still there. Don’t tell me they got rid of them already, that would be a shame. Unless they sold them all out and it’s limited edition. If there’s no Harmon or Walgreens nearby or they’re all gone for good, maybe you could try eBay? Someone might be selling the entire collection there.